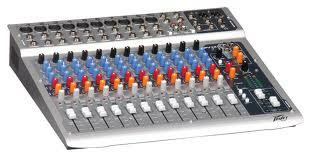 Having a mixer put into your recording set up can be an extremely useful thing. If you run a simple Pro Tools set up, a decent size mixer is nice because you can plug in a couple mics, a keyboard, a drum machine and more. Then you can just run the mixer into your DAW for recording. Everything can always be plugged into the mixer so you do not have to keep unplugging equipment. The Peavey PV14 is a nice size mixer for home studios. It features 12 channels and 10 of them have a microphone input. The mixer is really quiet and easy to use. I was very impressed with the whole package. It has some nice master controls and outputs for headphones, control room and main. You will not be disappointed with this mixer. It sells for $300 at guitar center. Click the link below for an exclusive deal.